Working nights at Zeppy’s Bakery in Randolph, Scott Tingle had saved up enough for his first year of college at Southeastern Massachusetts University, now UMass Dartmouth. But about halfway through his freshman year, he realized he’d need more cash to keep going. So he enlisted in the Navy as a reservist — a pivot point in the 52-year-old’s life trajectory. Now, the Attleboro-born, Randolph-raised, Blue Hills Regional Vocational Technical High School graduate-turned-naval aviator and test pilot, is an astronaut. “The space program was one of those things that was just in my soul,” he said in an interview with the Globe Thursday from the International Space Station, about 250 miles above the earth. Tingle, who is married with three children, and whose mother, brother, and sisters still live in Massachusetts, blasted off towards the ISS from the Baikonur Cosmodrome in Kazakhstan on Dec. 17 and is set to be in space until April. He’s part of a six-person international crew on the space station that conducts scientific experiments and keeps the low-orbit vessel running. In the interview, which was broadcast on NASA TV, Tingle says the day usually begins at 6 a.m. with breakfast and preparatory work. Tingle said they have about 200-250 experiments running at any given time in the ISS, so it can get pretty busy. One of the experiments he said he is working on involves seeds in a solution in Petri dishes that were sent up to the space station. They are in an incubator, and the team looks at them to see how they germinate — taking photographs, making measurements. Tingle said the goal is to better understand how plants will germinate in space. That could lead to greater efficiencies back on earth and help NASA understand how to better feed astronauts on longer-duration missions, such as to the moon or Mars. And it’s not just inside work that keeps Tingle and his colleagues busy. 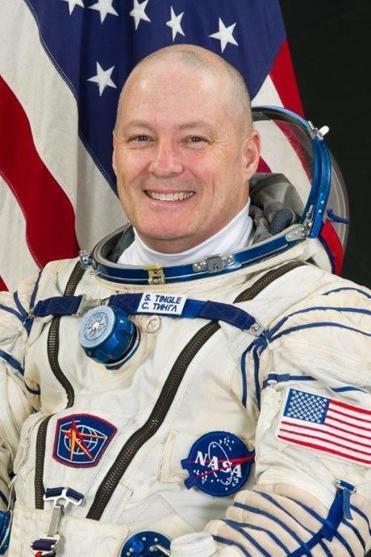 The first one will include Tingle and Mark T. Vande Hei, a NASA astronaut who launched to the ISS in September. In high school in Canton, Tingle did different kinds of hands-on work. At a vocational school, he did everything from welding to design work as a machine draftsman. Tingle says he loved it and got interested in space. He studied mechanical engineering for his undergraduate and graduate degrees, the latter from Purdue University. Commissioned as a naval officer in 1991, he graduated from the elite Navy Test Pilot School in 1998. His career includes stints as a test pilot and as an aviator in combat with 54 combat missions, according to his official biography. Tingle stays busy, but he does have time to miss things back on earth, including his wife and children, other family, and friends. After the interview concluded, Tingle took his microphone, flipped it in the air, and grabbed it before it floated away.